Error #31(0x1F) is a tech support scam that tricks users into revealing their sensitive information or calling the support number. These alerts are fake and caused by the adware-type intruder. You need a full system scan to find all similar threats and remove them from the PC. 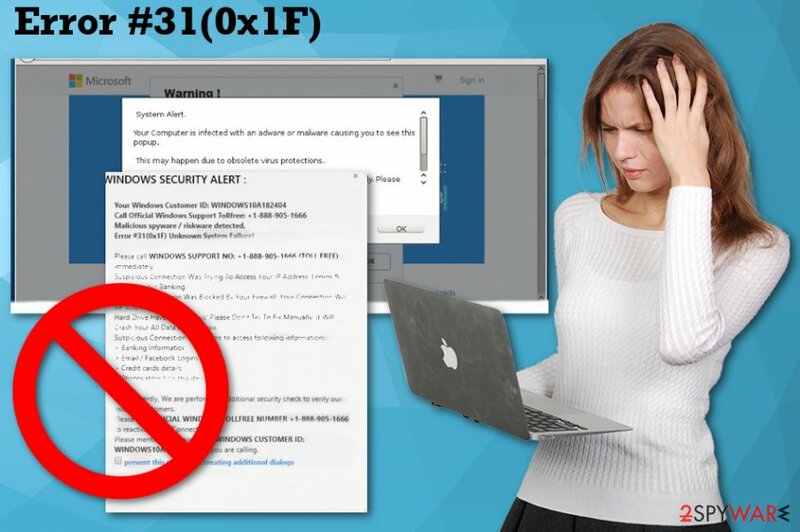 Error #31(0x1F) virus is a scam that tricks people into thinking their device is at risk. Error #31(0x1F) is a malicious program that displays a deceptive pop-up window with the message about possible system failure or danger to your sensitive information. However, this is a fake alert, and there is no danger to your system or credentials besides the adware-type virus displaying intrusive content without your approval. 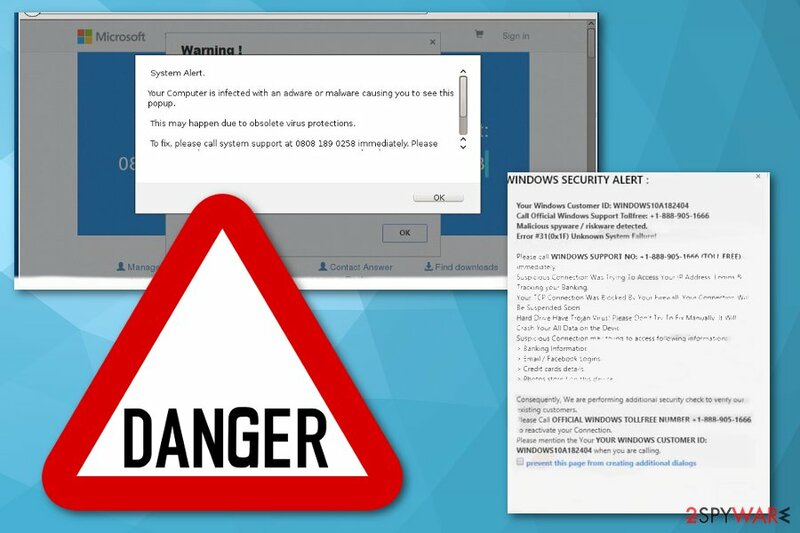 Typically, the virus is causing a pop-up window filled with a Windows security alert and informing the victim about the presence of malicious programs. Additionally, it encourages people to contact the alleged support via +1-888-905-1666 or other numbers immediately. Unfortunately, calling the number may lead to cybercriminals or scammers who are seeking to get your personal information or money for their “technical support.” Beware that by entering your banking details, you can reveal them to scammers as they can use a fake screen posing a legitimate bank page. You should ignore such alerts and keep in mind that Windows technical support has never asked for money. Error #31(0x1F) can also cause slowness of the browser or device in general and this way users get tricked that the system is infected. Nevertheless, your details might be at risk, especially if the message keeps popping up or you contact the suggested number. Researchers note that similar errors like Error #31(0x1F) can indicate various problems with the device, but there is no need to call the provided numbers. Often these tech support scammers talk with a foreign accent and this fact should be a first indicator that the support is not legitimate. You should employ a reputable anti-malware program and scan the system instead. This way you can remove Error #31(0x1F) from the system and keep on using the machine safely. You should use Reimage or any other tool and follow the suggested steps. The program indicates possible intruders and terminates malicious programs. Automatic Error #31(0x1F) removal is the best option because the program causing these fake system alerts comes without your consent or knowledge and often via software bundles or from deceptive ads. A full system scan eliminates all similar programs and browser extensions or plugins. Error #31(0x1F)scam is adware-type program causing intrusive content and fake messages about the system failure. In most cases, potentially unwanted applications like adware, browser hijackers or fake system tools come via software bundles because developers pack their products alongside various freeware and spread these bundles around the internet. When you get freeware from questionable sources, you risk getting additional programs like fake system alerts causing adware. You can avoid these infiltrations if you choose Advanced or Custom options during freeware installation. By doing so, you get an opportunity to decide what programs get installed on the device. If you skip through these steps and select Default or Quick options, you automatically agree to all additional programs. Also, keep your security software up-to-date, so suspicious websites can be blocked before you enter them. Remove Error #31(0x1F) and forget about those deceptive alerts and commercial content constantly delivered to your screen. You can do so by scanning the system entirely using reputable antivirus tools. If you have a program that you can trust make sure to follow the suggested steps. If you need a software suggestion for Error #31(0x1F) removal, we have listed a few programs that we as security researchers can trust and recommend. This method of virus termination takes less than 15 minutes and gives you an advantage of eliminating all possible threats. You should also remember that Error #31(0x1F) virus may install additional content on your browser, so you should check your Chrome, Firefox or Excel browser for suspicious extensions or toolbars and change settings to default on every one of them. Here, look for Error #31(0x1F) or any other recently installed suspicious programs. When in the new window, check Delete personal settings and select Reset again to complete Error #31(0x1F) removal. Once these steps are finished, Error #31(0x1F) should be removed from your Microsoft Edge browser. Here, select Error #31(0x1F) and other questionable plugins. Click Remove to delete these entries. Now you will see Reset Firefox to its default state message with Reset Firefox button. Click this button for several times and complete Error #31(0x1F) removal. Here, select Error #31(0x1F) and other malicious plugins and select trash icon to delete these entries. Click Reset to confirm this action and complete Error #31(0x1F) removal. ^ Protect yourself from tech support scams. Support. Microsoft community. ^ Catalin Cimpanu. After Microsoft complaints, Indian police arrest tech support scammers at 26 call centers. ZDNet. Technology news, analysis and reviews. This entry was posted on 2019-01-29 at 05:11 and is filed under Adware, Viruses. You can quickly scan the QR code with your mobile device and have Error #31(0x1F) manual removal instructions right in your pocket. How did you remove Error #31(0x1F)?